Following enhancements to the iTunes Connect functionality, Apple has begun to empower more control to developers when it comes to the multiplayer features and Game Center integration. Developers are now able to delete scores that they believe are fake, enabling a fairer experience for users across the board. 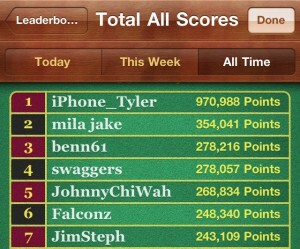 You can now view and manage the top 100 scores and usernames for all of your Game Center leaderboards. Protect your legitimate players by signing in to iTunes Connect to delete fake scores or block players that post fake scores. You can also restore scores and players within the same time period. To learn more, read the Managing Game Center Leaderboard Activity section in theiTunes Connect Developer Guide. Developers can now delete fake scores and also block players who post those scores to the global leaderboards in the first place. Previously, it was only Apple who could make those changes and generally they didn’t get removed. You only have to open a multiplayer game on iOS in Game Center to see some of the ridiculous scores that have been obtained by cheating or by falsifying their in-game score that gets sent to Game Center to hit the leaderboards. Given the number of users that seem to be sending in fake scores, it usually renders the leaderboards useless, only displaying the top 100 players who have seemingly achieved maximum scores. Handing the control over to developers should allow cheaters to be spotted and removed pretty quickly, since who better to determine a ‘real’ score than the people who built the App in the first place? This is definitely a welcome addition to the iTunes Connect interface between developers and Apple, and will hopefully make the Game Center leaderboards a place which will encourage friendly competition, as it was intended.